The West Antarctic Ice Sheet (WAIS) is part of the continental ice sheet which covers West Antarctic, the portion of Antarctica on the side of the Transantarctic Mountains which resides in the western hemisphere. The WAIS is residing on an archipelago with the center of the dome set over sub glacial uplands and bedrock basins, with the bedrock basins being more than 1,500 m below sea level. The WAIS contains 3.8 million km3 of ice, if this were ever to collapse and fall into the ocean, at the present rate of accumulation, it would take over ten thousand years for the ice to be restored. For around four decades there have been fears that there could be marine instability, fears caused by the retreat of the ice margin into basins which would lead to massive ice-mass loss and increased ice-calving, which would then result in the loss of the WAIS, resulting in a rapid-rise in sea level of 3-5 m.
A study recently published on the stability of the WAIS divide over the last 1.4 million years gives reason to believe that the divide of the WAIS has fluctuated only modestly in location and thickness for that amount of time. 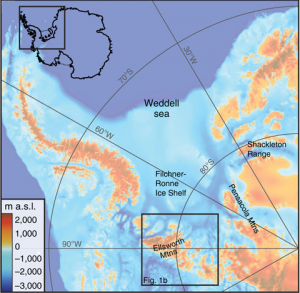 The Heritage Range which lies in the center of the Weddell Sea embayment is within 50 km of the floating Filchner-Ronne Ice Shelf and the grounded ice sheet in the Hercules Inlet. Two massifs are summits which cover 15 km of upland bounded by troughs excavated to below sea level. Ice from the central WAIS flows between and around the two mountains at the grounding line. The WAIS divide forms a large saddle (highest point between two massifs) between the main dome 300 km to the west, and to another 200 km northwest. Katabatic winds flow down the ice slope from the divide towards Hercules Inlet crossing the mountains and creating blue-ice areas. The winds cause the surface ice to melt which then causes an upward flow of ice which brings basal debris to the surface as blue-ice moraines. This ice-marginal, basally derived material is deposited higher on the mountain flanks and records past changes in ice thickness. By using cosmogenic nuclide dating on the bedrock and nunataks (exposed, rocky ridges) data had been provided of the thickness of ice over time. A plethora of data was provided revealing data from ages of up to 400 ka. This lead the researchers to the hypothesis that the spread in ages represented the continuous presence of an ice sheet that fluctuated in thickness in response to glacial to interglacial cycles. The range of ages gives rise to preservation of some erratics (rocks alien to the locale) and deposition of other ice sheets during successive glaciations. Subglacial topography of Antarctica showing the location of the WAIS in the Ellsworth mountains and geographical features within the Weddell sea. The data from the study shows that the highest erratics are exposed for the longest time, and lower erratics are exposed for increasingly shorter times, this gives evidence of increased burial with decrease altitude. The implications of exposure ages of up to 1.4Ma at high elevations is that ice thickening and blue-ice moraine formation also occurred during earlier glacial cycles in the Pleistocene epoch. Due to mountains being seated near the grounding line of today, an increase in ice thickness near the mountains would agree with any seaward migration of the grounding line as ocean temperature cooled and global sea level fell. Over exposed periods of time you would expect glacial erosion to decrease ice-sheet surface in accordance with the mountains, triggering a cycle in changes of ice thickness superimposing a trajectory of lowering relative to the mountains. This is consistent with history. It was argued that there were exposure periods of where the WAIS divide had adequate intervals of time to disappear, if it was to disappear then ice caps and glaciers would likely have built upon mountain massifs in a fjord landscape, however there is was evidence supporting this, instead pointed towards the continuous presence of an ice sheet in the southern sector of WAIS for the entire duration of 1.4Ma, this ice sheet adjusted to accommodate to the loss of marine-based portions of the WAIS during the interglacial periods, the intervals where the divide could have disappeared. This ice sheet has continued to stabilise the WAIS divide for over 1.4Ma and can be predicted to do so in the future as it gives no indication of loss in stability.